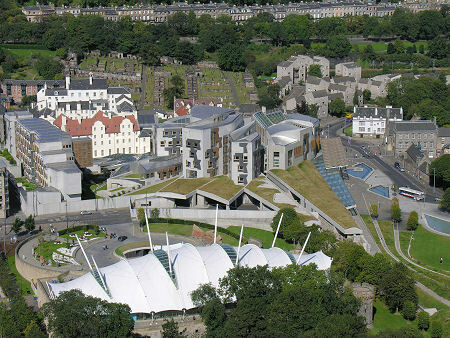 The Scottish Parliament from Salisbury Crags. The White Building in the Foreground is Dynamic Earth. "There shall be a Scottish Parliament." This was the opening clause of the Scotland Act 1998 which led the following year to the establishment of the first Scottish Parliament since 1707 (see our Historical Timeline). These are also the words inscribed on the head of the Mace of the Scottish Parliament, handed to the Parliament by the Queen at the official opening of its first session on 1 July 1999. 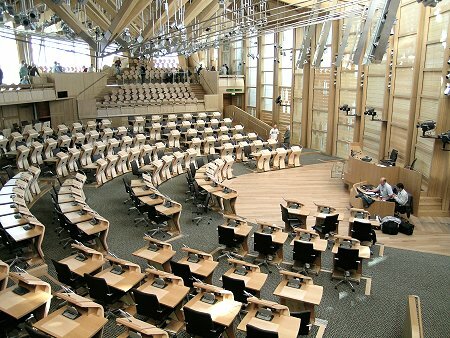 For the first four years of its new life the Scottish Parliament usually met in the Assembly Hall of the Church of Scotland on The Mound in Edinburgh, while Members of the Scottish Parliament (MSPs) had their offices in a nearby office building borrowed from Edinburgh City Council. Meanwhile a new Scottish Parliament Building was being built near the foot of the Royal Mile on a site previously occupied by a brewery. 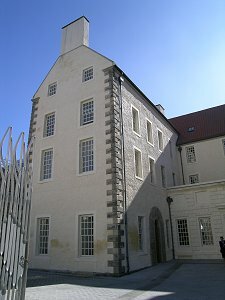 The design and construction of the new building was the subject of huge controversy in Scotland. Initially thought likely to cost around £50m, it ended up costing £414m. 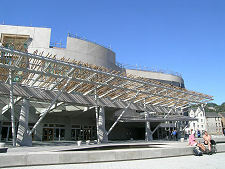 The Scottish Parliament Building opened for business, and to the public, in Autumn 2004. Was it worth £414m? Opinions inevitably differ wildly: but it seems clear that had the process been managed differently, the same building could have been constructed at rather lower cost. 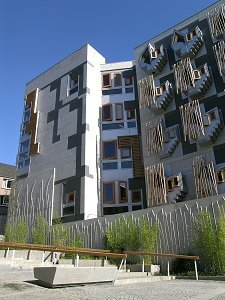 But is the Scottish Parliament Building a fitting home for the Scottish Parliament? Again, not all would agree. 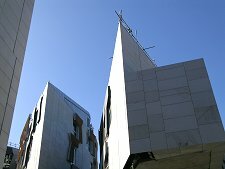 But for us the Scottish Parliament represents the rebirth of a nation that for over 290 years merged its concerns and interests with the often different priorities of a much larger neighbour. We're obviously biassed, but for us the best nation in the world deserves the best parliament building in the world. And we believe we now have it. 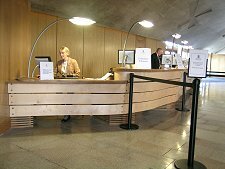 The Scottish Parliament Building is open to visitors 6 days per week almost all year round (see details on right), and admission is free. What you can see depends on whether it is a business day or not (i.e. whether the Parliament is sitting that day). On business days admission to the public gallery of the debating chamber is by (free) ticket. 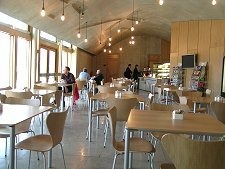 Visitors also have access to the Main Hall on the lower level of the Debating Chamber Building, and to the shop and café there. 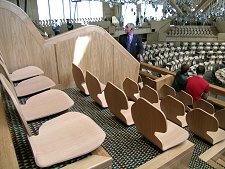 On non-business days including all recess days and Saturdays it is possible to visit the public gallery of the Debating Chamber, or to take a fuller guided tour of Parliament Building which is also free. Contact information is shown on the right: booking is essential for the tours. And a visit the Scottish Parliament Building really should now form part of any visit to Edinburgh. When we first saw the Great Hall at Stirling Castle we wondered how amazing its vast space must have seemed to the average early 1500s visitor. 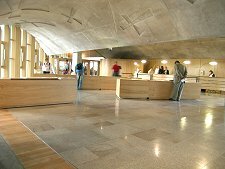 Your first experience of the Debating Chamber at the Scottish Parliament Building must give much the same feeling of awe and wonder. 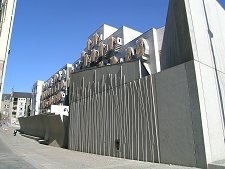 Over time the controversy surrounding the Scottish Parliament Building will fade: but we hope the magnificence of the building itself will remain undimmed. Much of the controversy revolves around the roles of two men who are now both dead. One was Enric Miralles, the Barcelona architect who designed the building. The other was Donald Dewar, who as Secretary of State for Scotland from 1997 pushed through Scottish Devolution; and then became Scotland's first First Minister from 1999 until his death in 2000. He was the driving force behind the early stages of a Scottish Parliament Building that now stands as a fitting tribute to both men.